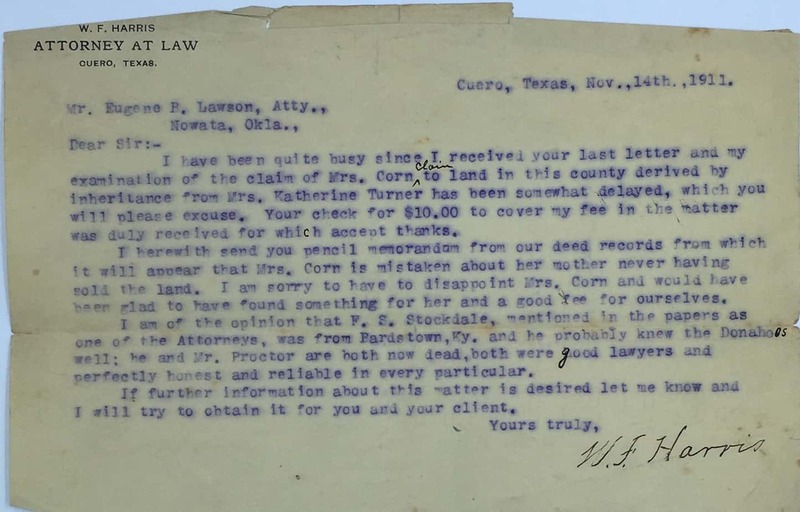 In 1911, Mrs Corn (I assume this to be Annie Lois Turner Corn, granddaughter and heir of Catherine Donohoo Turner), hired an attorney in Nowata, Oklahoma to determine if Mrs. Catherine Turner owned land in Texas at the time of her death, which would mean Lois and her sister Eula were entitled to it by inheritance. W.F. 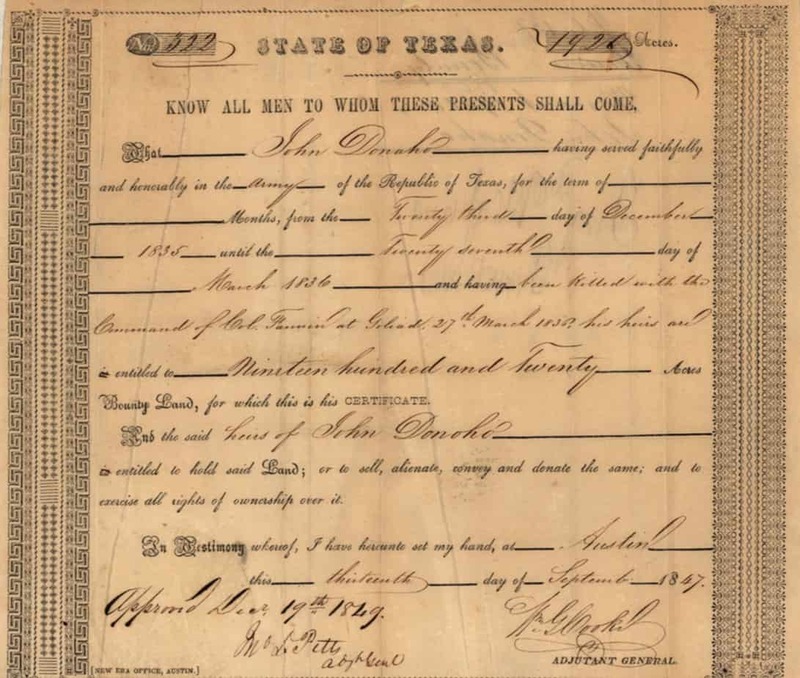 Harris of Cuero, (Dewitt County), Texas replied with a series of several transcribed documents showing the heirs of the land, including Catherine Turner, selling their interests in it in the 1880s. This post is part of the Donohoo Descendancy Project. Annie Lois Turner Corn was a granddaughter of Catherine Donohoo Turner, a daughter of Patrick and Sarah Donohoo. John Donohoo (the elder) and John Donohoo (the younger) were sons of Patrick and Sarah Donohoo. This summer I received the genealogical materials that my dad had in his possession. 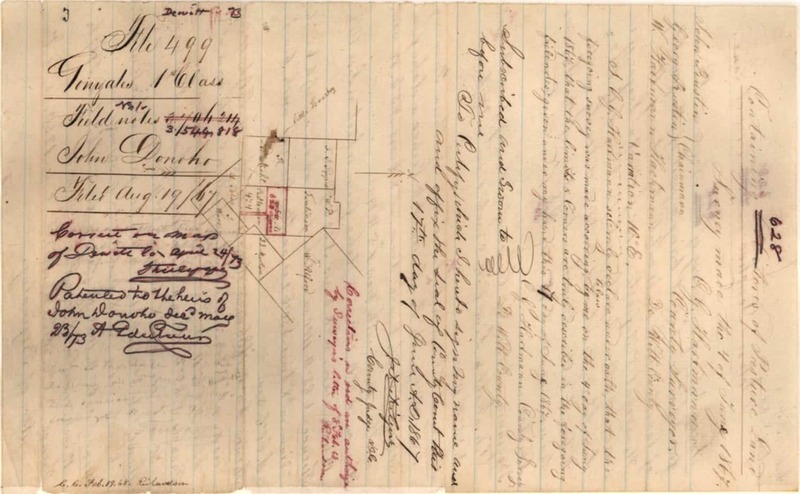 Among the photos and documents was a typed note and several hand written transcriptions of land documents from the settlement of a John Donohoo’s heirs’ lands in Coleman and DeWitt Counties, Texas. 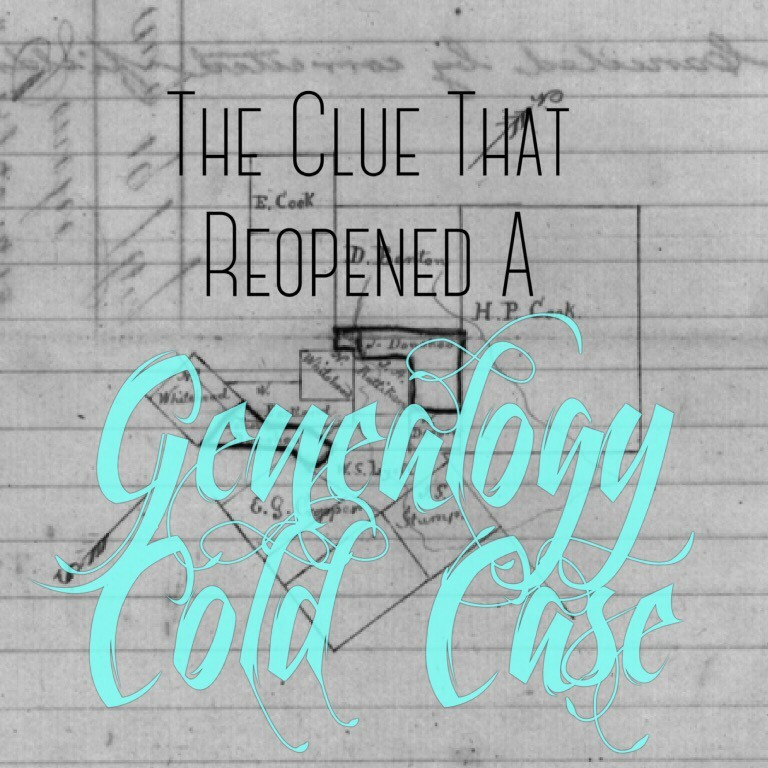 I became ecstatic as I read these documents, as my own research on the two sons named John Donohoo, of the Patrick and Sarah Donohoo family, had gone cold. John the elder presumably died sometime between the 1830 census and 1836, when his baby brother was named after him [See Another Son, A Tick Mark, and a Recycled Name]. John the younger’s trail went cold after he deserted his military post during the Civil War. 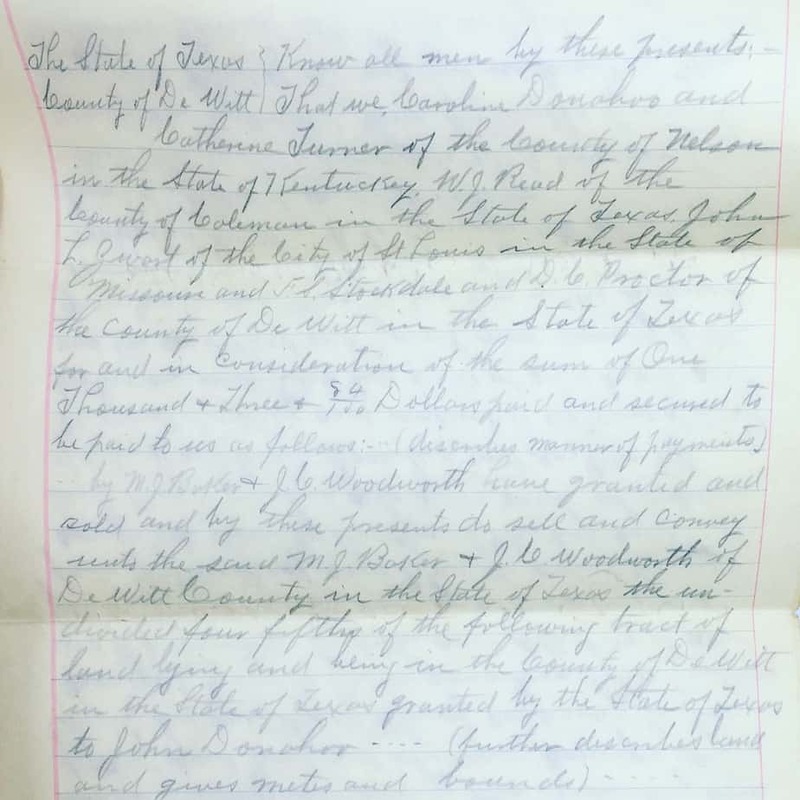 This document confirmed that John from the land documents was a part of the family, as the property was explicitly left to his heirs: his sisters, Catherine Turner, Mrs. Sarah A. Bishop and Mary Donohoo, and his sister-in-law, Caroline Donohoo. I just had to sleuth out which John this was, and how and when he obtained land in Texas. 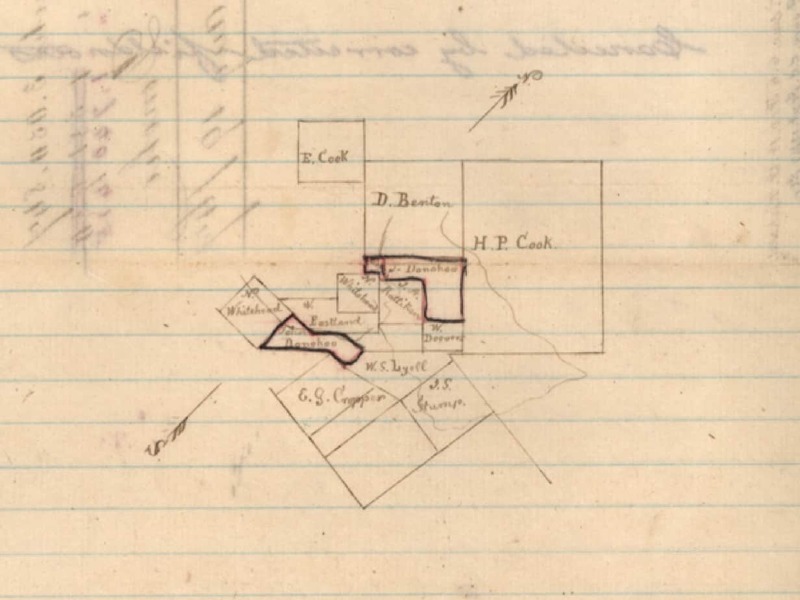 I started an online search in Coleman and DeWitt Counties for anything about a John Donohoo and first came across a couple of deed index records for land in DeWitt. I made a note to look for the actual deeds later and continued my search. Then I came across a Find-A-Grave indexed record that seemed plausible, so I clicked through to the Find-A-Grave site. I got chills as I read the memorial: John Donohoo who was killed at Goliad on March 27, 1836. The memorial states that he was serving under “Captain Burr H. Duval’s Company, Kentucky Mustangs–First Regiment Volunteers from Bardstown, Nelson County, Kentucky. Captured and executed Palm Sunday 27 March 1836 by order of Gen. Santa Anna.” Oh my goodness! The Donohoo family lived in Bardstown where these Kentucky Mustangs were recruited. John the elder would have been 20 years old when they assembled the group. His younger brother was born named after him in 1836. I wondered if this executed soldier was the first John Donohoo of the Patrick and Sarah Donohoo family. Next I just had to know more about Goliad, and what event took place there on March 27, 1836. What I found has to be one of the most horrible events of the Texas Revolution. Gen. Santa Anna ordered the soldiers at Fort Defiance to execute their Texian prisoners captured in battle days before. Between 425-445 men were executed as a group, point-blank that day. Their bodies were piled and burned, then left to rot. As I continued to look into the Kentucky Mustangs at Goliad, I learned that 35 Kentuckians, most from Bardstown, died in the massacre that day. A monument was erected in their honor in Bardstown, Kentucky. But what was John Donohoo’s role in the Kentucky Mustangs, was he related, and where did the land come from? In searching these questions, I came across old query posts at genealogy.com about John Donohoo who died at Goliad. 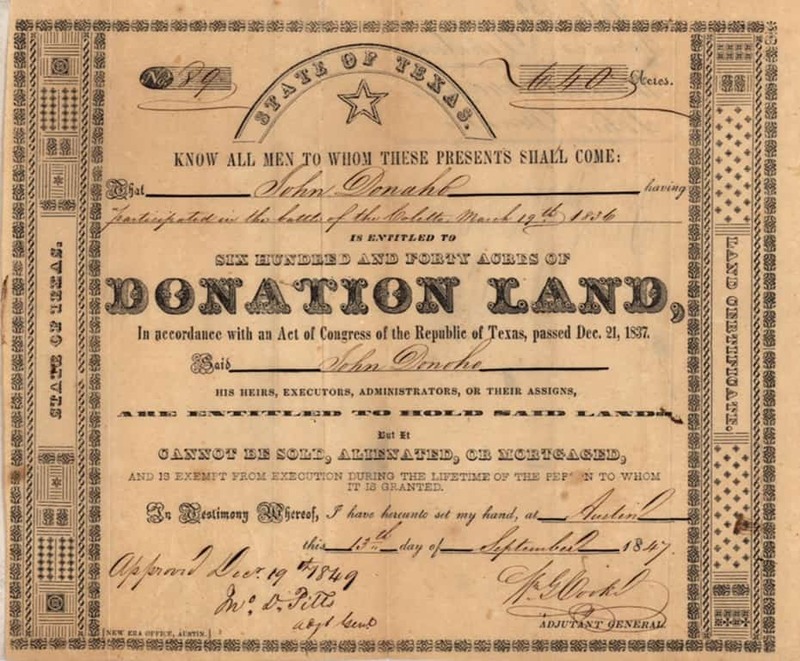 The poster, who had done his own research on John, quoted from a book “Bounty Land and Donation Land Grants of Texas, 1835-1888” about several pieces of land that John Donohoo’s heirs were granted for his service. The last query post was from 2007, but I hoped an email might still get through. So, I emailed the poster to see if he would share his research with me. I was happily surprised to received an enthusiastic response the next morning. I am patiently awaiting his research materials. In the meantime, using the deed index records, and the bounty land info from the query post, I went online to the Texas General Land Office and searched the indexes to confirm these deeds, and find any others. I emailed the TGLO to order copies of the actual land patent documents, which happen to be online as a very nice person there informed me over the phone early the next morning. I need to study the 60+ pages of documents more carefully, but after a couple of cursory readings, the land that John Donohoo who died at Goliad received for his services, and the land my Donohoos are disposing of as John’s heirs is the same land in Coleman and DeWitt Counties! Unfortunately, I think the person transcribing the documents for Lois Corn got tired, and put in notes like “further describes land and gives metes and bounds”, so I will need to get copies of the original documents to match the land for certain. But I think the connection is there. The Texas land in Coleman and DeWitt Counties was granted to John Donohoo’s heirs as payment for his service in the Texas Revolution. His siblings, his heirs, later sold the land, and my great-grandma confirmed that when she hired an attorney to look into it in 1911. At last the mystery of John the elder might be solved.